Four winners of The Petr Cech Football Academy had the opportunity to look under the lid of everyday life in the Arsenal FC. Tadeáš and Vojta from the academy in Zruč and Ondra and Matěj from the second location in Nymburk spent four unforgettable days in London. We began with the Emirates Stadium tour on Friday. „It was incredible experience I sat on Aubameyanga´s place in the dressing room“ says Matěj Polcar, the goalkeeper of SK Kladno, who became one of the best strikers in Premier League for a while. On the second day we visited the Training centre of Arsenal FC. It is almost impossible to get there but thanks to Petr Čech we got the permission. „The training centre is a dream of every football player, it is like from another world“ evaluated Ondřej Kvapil, who plays for Valašské Meziříčí. Eleven training playgrounds, one-football-playground big gym, room for analysing matches, one special room only for players´s boots. There was really everything. After the tour we had a training with Jason Mason in Arsenal Hub. Jason Mason is one of the Arsenal youth coaches. „The training was dynamic and I really enjoyed it“ said Vojta Heřman. On the third day we started by short sightseeing in London and then the most thrilling experience was to come. 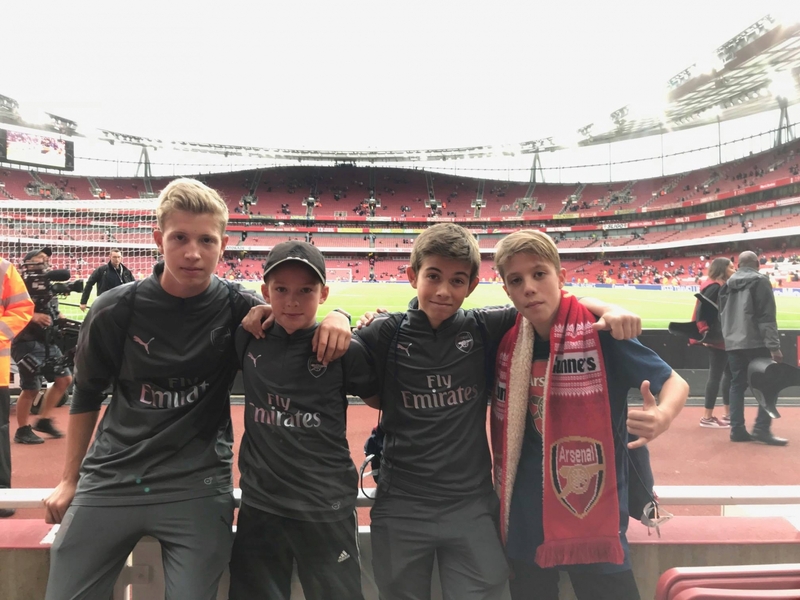 The highlight of the whole trip – the match between Arsenal FC and Manchester City. The mood was excellent, all the Arsenal fans were tuned for the victory under the lead of the new coach Unai Emery. We saw Petr Čech playing the whole match. He saved his team many times but unfortunately it was not enough. The match ended with a loss of Arsenal FC but we really enjoyed the atmosphere among 60 thousands of cheering fans. Of course we did not forgot to buy some souvenirs in the biggest Fanshop we have ever seen.